Crooked, misaligned teeth effect far more than your smile. Without effective treatment, this seemingly minor issue sets the stage for serious complications, such as gum disease, bone loss, headaches and even TMJ/TMD symptoms. For decades, the industry standard to correct dental issues was metal orthodontic braces. While effective, its permanent fixture for months and highly visible design made it undesirable by both children and adults. However, the face of orthodontics changed with the invention of Invisalign. Smile Gallery Dental Clinic delivers world-class dental care for our local Box Hill community and for our neighbours. Whether from Surrey Hills, Blackburn or beyond, let our dentists with a combined 40 years of experience transform your beautiful grin into a beaming smile with Invisalign. Pioneered by Align Technology in 1999, Invisalign has restored the confidence, comfort and function to over four million patients. This non-threatening orthodontic appliance opened the world of dental restoration to people who required braces, but weren’t likely to choose a traditional treatment option. 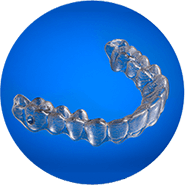 As its name suggests, Invisalign operates just as orthodontic braces, but in a virtually invisible mouthguard design. Instead of a mouthful of brackets, wires and bands, teeth are gently shifted into proper position. Made out of the patented SmartTrack material, Invisalign moves teeth up, down and can even fully rotate a tooth, if necessary. In essence, this treatment is similar to traditional orthodontics. Both reposition teeth by incrementally putting pressure on problem teeth. But, Invisalign accomplishes this shared result without the need of noticeable brackets and wires. Instead, a series of aligners gradually shift misaligned teeth by maintaining steady pressure where needed, and not where it’s not. During your initial consultation, you’ll speak with your dentist and evaluate whether or not Invisalign is the best option for your unique condition. Your dentist will perform an assessment to make a final determination. The first step in creating an Invisalign treatment plan is to study your current dental condition. Your dentist may perform a digital scanner to create a 3D digital map of your teeth or take physical impressions, or moulds. From here, an exact treatment plan is created, which maps out the alignment process from start to finish. After completing this plan, you’ll know how long your treatment will last. You’ll receive your first set of aligners, which must be worn between 20 and 22 hours per day to achieve the ideal results. Based upon your unique situation, a new aligner may be required every week or so. Each new set works to continue shifting problem teeth. Throughout your treatment, you’ll periodically visit your dentist to ensure accurate progress. Generally, no more than one appointment every six weeks is required. While the procedure duration varies based upon the complexities of your case, most treatments lasts anywhere from 9 to 15 months. Up until now, straightening your teeth has never been so easy, convenient and effortless. As a member of the Australian Dental Association, our dentists in Box Hill offer the latest in orthodontic services. If you’re teeth are misaligned and require correction, perhaps it’s time to experience the ease and power of Invisalign. Call us at (03) 8595 2632 and schedule your initial consultation today!